Missing out your potential customers in streets? 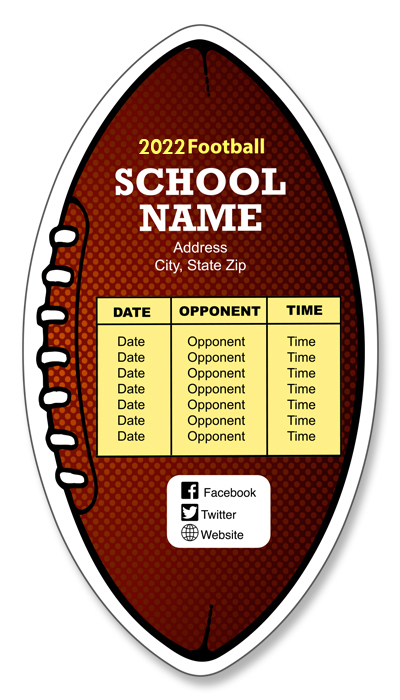 Our 3x5.5 Promotional Football Shape School Magnets - Outdoor & Car Magnets 30 Mil will allow you to gain access to plenty of new customers who are in the streets and other outdoor locations. As these custom school magnets are loaded with abilities like UV safe, fade resistant and water repellent, you can expect them to stay outside for long beating the attack of the harsh atmospheric conditions outside. Order custom printed magnets now to win our free digital proofs and free shipping offers. Request a quote to know the value savings that you can avail on bulk orders of 3x5.5 Promotional Football Shape School Magnets - Outdoor & Car Magnets 30 Mil.